Completed in 1912, St. Alexander Nevsky Patriarchal Cathedral Stauropigial Memorial-Church is an impressive landmark in Sofia . The church was built as a memorial to the 200,000 Russian soldiers who died in the Russo-Turkish Liberation War (1877-1878).It is a neo-Byzantine structure with glittering interlocking domes, constructed at the dawn of the 20th century. Try a visit on sunday when there is church choirs during church services, because this experience shouldn't be missed. Even if you're unable to attend services, be sure to visit the cathedral to examine its beautiful carved marble, friezes and icons. 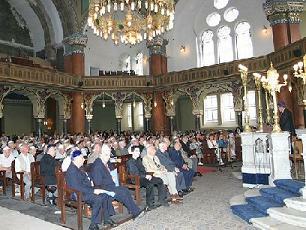 The other noteworthy church is Tsentralna Sofiiska Sinagoga ( Central Sofia Synagogue ), Ul. Ekzarh Yosif at Bul. Washington, a beautifully restored 1909 synagogue famous for its Moorish turrets and gilt domes. 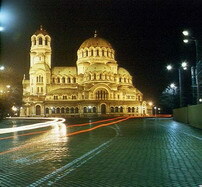 The synagogue in Sofia is situated in the very heart of the Bulgarian capital. It's dedicated to Russians who fell liberating Bulgaria from the Ottoman Empire. Try to visit the crypt, which is filled with a stunning collection of icons. Among the city's ten or so other top attractions, the most notable is Natzionalen Archeologicheski Musei (National Archaeological Museum), Pl. Alexander Batenberg, housed in a former Great Mosque and filled with artifacts of the country's cultural history -- notably the gold treasure of Vulchi Trun , a masterpiece of Thracian workmanship on 13 vessels of gold. Particularly interesting are exhibits of medievel Bulgarian cities, their focus is in between in the history in the 7th -17th century.